A sound approach to controlling alcohol behavior, including the physiological effects of alcohol, the differences in biochemical reactions to alcohol based on genetics, different types of alcohol addictions, environmental factors, and nutritional guidelines to mitigate or prevent damage and even help you detox safely. Here is a way to drink alcohol without the guilt, pain, hangovers and loss of control? Contains proven methods for lessening the effects of alcohol and not being a total slave to the booze. Learn which of the six alcohol biochemistries influence your reaction to alcohol and what you can do to counter and control the effects of drinking without becoming a teetotaler. You can enjoy your alcohol or give it up without painful withdrawal. You will find out how both your background, medical conditions and genetics can determine how alcohol will effect you and why it can make some people sleepy and lazy and others hyper and seemingly crazy. Learn to enjoy a few drinks without the empty wallet, hangovers and personal regrets. Easy-to-read format and end chapter reviews to assist retention. Written for college and university students by a former university student. 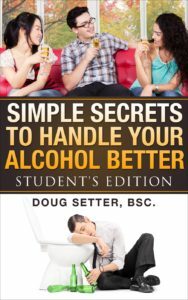 From the title, “Simple Secrets to Handle Your Alcohol Better”, you might think this book is about tips and tricks to drink more without adverse effects and therefore promotes drinking. Far from it. Doug Setter B.Sc comes from the realistic vantage that many people enjoy at least the occasional drink. He presents a sound, scientifically based manuscript that explores many aspects of alcohol consumption including: the physiological effects of alcohol, the differences in biochemical reactions to alcohol based on genetics, different types of alcohol addictions, environmental factors, and nutritional guidelines to mitigate or prevent damage and even help you detox safely. “Simple Secrets to Handle Your Alcohol Better” is a fascinating read. Much of the information is also relevant to general health and wellness. Mr. Setter’s book will benefit you even if you don’t drink alcohol because it has a wealth of information about nutrition, physiology, and allergies. It will also help you understand those who become addicted to alcohol better. And it gives you information that might help you when dealing with realities or friends who struggle with their alcohol. This was a great reference read. It brought up many scenarios and actions that could be taken. It gives very detailed information to use to base your best decisions in.–Cara C.
Here is your group guide done for you. Use with your teen, your group, your family. Broken into segments that can easily make for a whole course on alcohol dangers and avoidance. You can change your behaviors. Tough as it is to convince kids, it can be done. Young people are often surrounded by bad-news role models. As Doug Setter points out, not all of us grow up to be alcoholics, addicts, and troubled people in spite of poor upbringing. This book gives those headed in the wrong direction the tools to make wise choices and change their lives. Doug has a great voice. He boldly tips into uncomfortable places and does so with sound science and research. I enjoy what he has to say, and actually found it quite helpful. Read this book and learn.